as salty as the ocean. A seagull to recall a miracle of salvation in 1848. Cover: Painting at an art show. 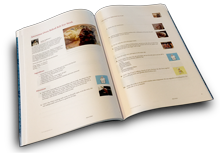 Thanks for including my recipes Nancy, and I love the idea of a cookbook from Utah cooks.